This interesting, colorful character is a favorite fern here at Jenkins. In early spring, its silver-haired shine erupts in tightly curled ‘fiddleheads’. As they continue to unfurl and mature, their white hairs turn cinnamon colored, and hummingbirds collect them to line their tiny nests. When fully mature, its fronds are large, ranging from 2 ½ to 4 feet long. The robust and swamp-loving cinnamon fern can tolerate some sun but prefers a wet woodland habitat. 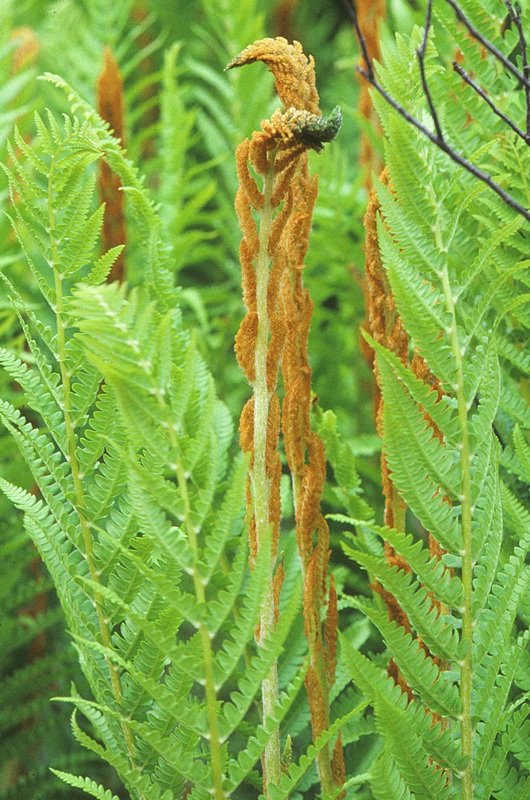 With fertile and sterile leaves, this ‘dimorphic’ fern has both rust-colored reproductive fronds, wispy green vegetative fronds, and outstanding bronze fall color. It is common from Zones 2 through 10.